More info:Price (per person) based on two people sharing a double/twin room ensuite for two nights on a dinner, bed & breakfast basis. Includes a first class day return on the Jacobite Steam train. The West Highland Railway is not only one of Scotland’s finest and oldest routes, with landscapes and lookouts that change every few minutes, it is also considered by many to be one of the most magnificent railway journeys in the world. This Scotland short break, of just three days, starts in Spean Bridge in the Highlands, where you will spend two nights in a hotel with a superb location, with strolls directly out of the hotel that boast views out across Ben Nevis, Loch Lochy and the Great Glen. Enjoy your first day in Spean Bridge absorbing the landscapes but also the fine hospitality on offer at this small, family-run hotel, where wonderful organic food is par for the course, open fires roar and the kettle is always hot. The second day of this short break is on board the West Highland Railway, which you can catch at Fort William station about a mile from the hotel, so taxis will be arranged if needed. The journey itself, on a steam train, takes in beauties like Ben Nevis, the Britain’s westernmost railway station at Arisaig, Loch Morar and Loch Nevis. En route to its final stop in Mallaig, the harbour where boats leave for the Isle of Skye, the train travels over the magnificent Glenfinnan Viaduct, with twenty one arches spanning the valley, and then stops at Glenfinnan village. From here you can gain wonderful perspective out across Loch Shiel, and there is a quaint museum in the station to enjoy as well. For the rest of the journey, look out to sea on a good clear day for views across to beautiful islands of Rum, Muck, Eigg or Canna as well as the world famous silver strands at Morar. 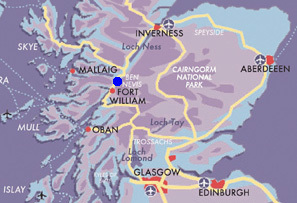 Return to Fort William on the 4pm train, where another taxi can be arranged to meet you. We are continually increasing our range of public transport holidays for those who want to leave the car behind. We grapple with the timetables of trains, boats and buses, and fill-in the gaps with short taxi transfers to make this possible in the more remote, rural areas. Not having a car in tow can transform your experience, especially in the Scottish Highlands – exploring the area around your hotel on foot helps you to properly engage with the environment and experience the place at a more appropriate, slower pace. This particular holiday provides a wonderful highlight of first class train travel on the West Highland Line, and we can add-on rail travel from anywhere else in the UK, so there is no need for a car at all. The hotel also has a reedbed which purifies waste water before it is returned to the stream in the garden. We are corporate members of the John Muir Trust, and in this way support their aims to safeguard iconic wild lands such as Ben Nevis, Sandwood Bay and the Red Cuillin on the Isle of Skye, add weight to their campaigns against inappropriate developments in wild places by standing up for wild land, help fund their work in partnership with local communities in wild land areas, thus contributing to the long-term sustainable development of the Trust and making a real difference to wild places by reinforcing John Muir’s message that we need wild places for nature and people. For us, true sustainability means promoting and helping to maintain a way of life in remote, often rural locations, where the economic benefit from tourism can make a genuine difference. That’s why we work almost exclusively with local, family-run businesses, not with large corporate organisations. We build close and lasting relationships with our business partners, based on mutual trust and an unerring commitment to customer satisfaction. The hotel featured in this holiday fits the bill perfectly - with a strong environmental policy and commitment to serving locally-sourced organic food. Jacobite steam train and the ben Nevis range cable car and walks at the top. Responsible travel were very efficient and all travel went smoothly. The hotel is a superb venue, run by nice people. Clean, comfortable and great food.